High Quality Content by WIKIPEDIA articles! The factorization of a linear partial differential operator (LPDO) is an important issue in the theory of integrability, due to the Laplace-Darboux transformations , which allow to construct integrable LPDEs. Laplace solved factorization problem for a bivariate hyperbolic operator of the second order (see Hyperbolic partial differential equation), constructing two Laplace invariants. 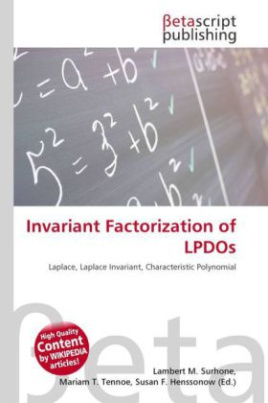 Each Laplace invariant is an explicit polynomial condition of factorization; coefficients of this polynomial are explicit functions of the coefficients of the initial LPDO. The polynomial conditions of factorization are called invariants because they have the same form for equivalent (i.e. self-adjoint) operators.